In any electrical installation, some current will flow through the protective ground conductor to ground. This is usually called leakage current. Leakage current most commonly flows in the insulation surrounding conductors and in the filters protecting electronic equipment around the home or office. So what’s the problem? On circuits protected by GFCIs (Ground Fault Current Interrupters), leakage current can cause unnecessary and intermittent tripping. In extreme cases, it can cause a rise in voltage on accessible conductive parts. Insulation has both electrical resistance and capacitance—and it conducts current through both paths. Given the high resistance of insulation, very little current should actually leak. But, if the insulation is old or damaged, the resistance is lower and substantial current may flow. Additionally, longer conductors have a higher capacitance, causing more leakage current. That’s why GFCI breaker manufacturers recommend one-way feeder length to be limited to 250 feet (76.2 m), maximum. 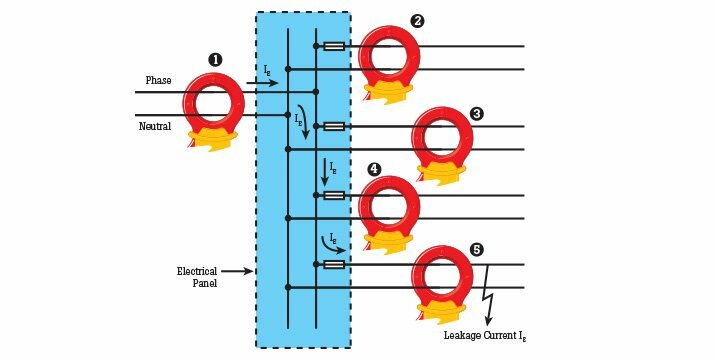 Find out more about leakage current basics, how to minimize the effects of leakage current, and the measurement of leakage current to ground in our application note "Leakage current measurement basics."